Need a spooktacular treat? Try this Ghost Sundae for some hauntingly fun times! Place some brown and orange sprinkles onto a plate. Add 1 scoop of Rich & Creamy Vanilla ice cream on top of the sprinkles. After transferring the whipped topping to a piping bag with a star tip, pipe the whipped topping in a circular motion to completely coat the ice cream. With a small spoon or spatula, smooth over the whipped topping. Top with 3 chocolate candies to create eyes and a mouth. Oh, vanilla ice cream. You are the foundation to all things rich, creamy and delicious! 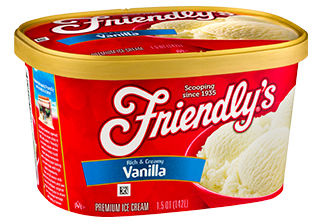 Give Friendly’s vanilla ice cream a try and see what all the fuss is about.